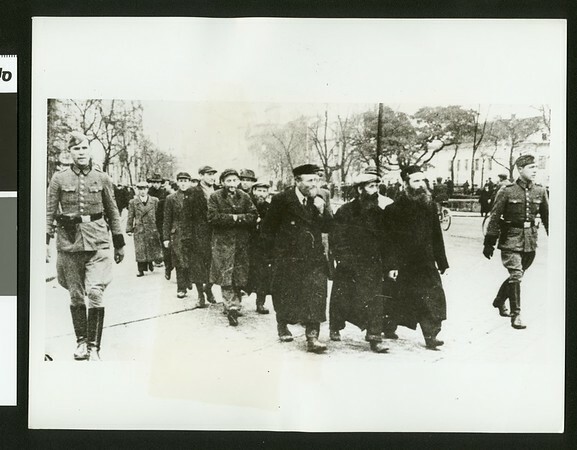 Photograph of a group of rounded up Polish Jews in 1940 Warsaw. "KY903503 | Watch your credit | International News Photo | Slug (roundup) | Hitler's Jewish terror in Warsaw| Warsaw, Germany [sic]... Flanked by agents of the Gestapo these Polish Jews form a pitiful column as they are marched to a concentration area. Most of the men are elders in the community who preferred to stay in the city of their birth rather than flee when they had the chance. (E-3-27-40)-4" -- typed note attached to verso. "Received. Examiner reference library. Mar 29, 1940" -- stamped on verso.